Retractable leash has become very popular in our country. We are seeing dog owners taking their furry friend to walk with this leash. But unlike popular beliefs, a retractable leash is an extended, thin cord wound around a spring instrument dwelling inside a plastic handle. These types of leashes have been formulated to fit comfortably in the human hands. Humans control the degree of the cord to be extended through a button given on the handle. If your pooch is powerful (by powerful we mean strong, good-sized dog) and he runs at full speed, the cord can snap. This will put your dog in danger along with the thing that he is chasing. The cord can even snap back at you and cause injury. When you grab the cord of a retractable leash in an effort to reel in your dog it can lead to a fatal accident wherein you can get entangled in the cord resulting in burns, cut and even amputation. 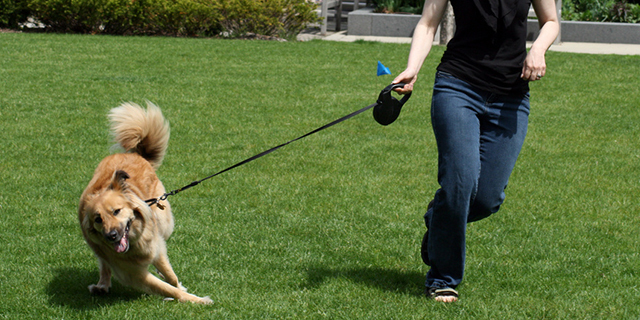 Several dog owners have experienced being pulled out of their feet when their pooch reached the leash end and kept going. This led to bruises, broken bones, and road rash. Many dogs fear from the sound of a dropped retractable leash leading to a situation that causes them to run off and the worst part is that the very thing that he is afraid of is now chasing him. If the leash is retracting while he is running the handle will more often than not gain ground on him which will make the confrontation worse. Even if things do not turn into worst possible scenario then also the doggie will forever fear while walking with you on leash. Dogs enjoy pulling at the edge of the leash which is a good thing for him, but other dogs who see him consider this as an aggressive behavior because they will not be able to see you far away which will make the situation worse. Dogs that run out the leash end up getting abrupt movement of their necks resulting in neck injuries, spine injuries and lacerated trachea. While training your pooch, it is strictly recommended to avoid using a retractable leash as it only encourages the doggie to pull on the leash causing serious injuries and the worst part is it is harder for you to correct it. Before using this leash, teach your pooch “come” and “heel” commands. Remember, a retractable leash symbolizes freedom. So let your tyke earn that freedom by winning your confidence first!! So are you going to use a retractable leash on your pooch? Let us know your views in the form of comments. PREVIOUS POST Previous post: What would your Pooch Say to you if they could talk?